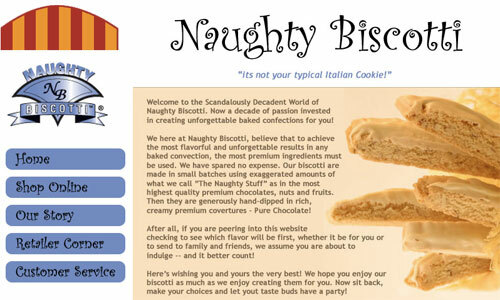 Naughty Biscotti has been a client of abbaroo.com since 2006. We redesigned the site in 2007, creating the buttons along the left side, and giving the site a cleaner, more modern look. The site uses the Yahoo online store so customers can buy biscotti on-line. In 2009 a wholesale ordering system was added with an area where wholesalers can login and order biscotti via a secure server.